The optical sensor with a short connection cable. Delivered in kit form with all electric parts assembled and tested. A PC computer, which you have provide yourself. Handle-in-pylon judge handle switch with cable. The sensor is contained in a box with a vertical slit opening on one side. It stands on a tripod. The height is 205 mm. In operation the box is placed on the ground with the slit facing the circle at a 21.5 meter radius (for the case of F2A, with 17.69 m lines). At this distance the box will stay clear of starting and landing models, but note that it will still need protection from dollies. The sensor employs a phototransistor for detecting the passing of a model by optical means. It is mounted on a printed circuit board that also has some important signal conditioning circuitry. The phototransistor receives light from the part of the sky in view through the slit. The angle of view is from 9° to 50° vertically, relative to the horizontal, and around 4° horizontally. The phototransistor light sensitive area is circular with a diameter of around 1 mm. The distance of the phototransistor to the slit is 110 mm at the lower limit and 200 mm at the upper. The slit is covered by a blue transparent filter, to reduce the contrast between clouds and clear sky, and to reduce the sensitivity to infrared light. 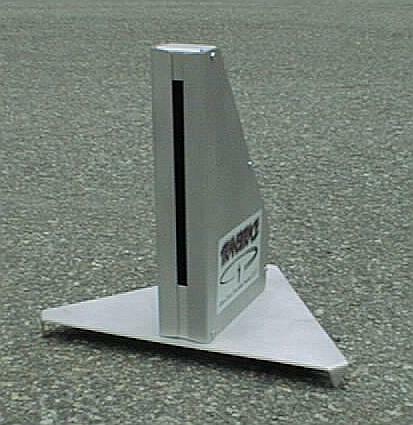 The unit should be aligned so that it stands horizontally, pointing towards the pylon. When a model enters the field of view, it obscures a small part of the sky, and the phototransistor current drops momentarily by a tiny fraction. The circuitry detects this drop and outputs a signal pulse, and blinks a red light on the rear panel. From the model dimensions, its range of flying heights, and the sensor field of view as above, the photocurrent drop can be estimated. For an F2A model it is around 0.5 %, and rather independent of the flying height: Low: Near sensor, but wing seen from oblique angle. High: Far from sensor, but wing seen at nearly right angle. To detect a current drop as small as fractions of a percent, some special techniques have to be employed to adapt to the lighting conditions and exclude light variations from other sources than the models. Think about this: The sensor must be able to detect a light change of only 0.5 %. At the same time, the brightness of the sky could vary by a factor of ten! In all a factor of 2000! There has to be a lower limit of the field of view, as objects near the ground must not disturb. The pilot, mainly (!!) but also background trees, circle fence and so on. This leads to models passing lower than around 0.6 meters (2 ft) being missed. Two more obvious limitations are that no direct sunlight must fall onto the phototransistor, and that the sky in view must be unobstructed. No tall trees or buildings in the rear! To block stray light, the box inside surface is covered by black velvet-like material. A minimum angle of 10° between the sun and the sensor direction is recommended. Also, the sensor should not be placed in the shade from the sun by trees, flags or other objects, as this could produce fast variations in stray light. The circuit board has four stages: Amplification of the phototransistor signal, filtering, thresholding and buffering. These stages are described below. The phototransistor current connects to an amplifier, designed to give an output proportional to the percentage change rather than the current itself. This way the operation becomes independent of the sky brightness. The second stage of the electronics is an amplifier with a bandpass filter, that blocks slow variations, as for instance from clouds, as well as fast variations, from internal noise. The third stage is a threshold circuit, which outputs a pulse when the output from the filter stage indicates a sudden drop of light larger than a certain percentage. By these three stages, the sensor is matched to objects with the typical speeds and sizes of C/L models. The last stage is a buffer capable of driving a long cable that connects the sensor to a PC. 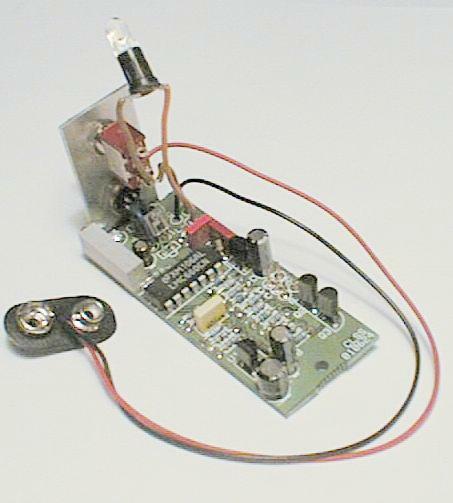 The unit is powered by a small 9 V battery. An alkaline battery will give over 100 hours of operation. There is also a battery sensor, sending a warning if the battery runs low. For contest use, the sensor should be placed under the marker for manual timing. 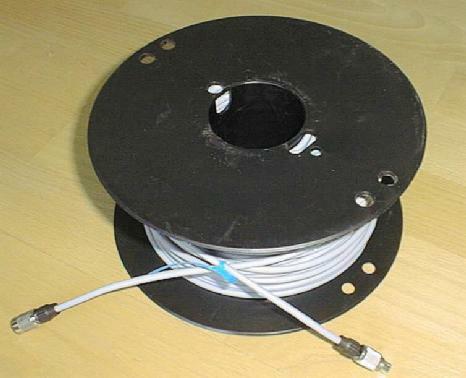 The output signal is then brought through an extension cable, 76 metres long, (see picture) to the location of the officials at the opposite side of the circle, where it is connected to the standard printer port of a PC computer. A program has been developed that records the times of the sensor pulses, counts the laps, calculates the speed, as well as the rest of the F2A flight procedure. There are means to get in synchronism with the manual timekeepers for the official flight. A hand operated switch also connects to the PC and is pressed by a timekeeper or handle judge when the pilot engages his handle to the pylon. The official result as well as the speeds for all individual laps are displayed and saved to a log file. There are also means to enter the manual stopwatch times, calculate and register the result from these. The flight log can later be viewed or printed and handed to the competitor. The F2A rules have been amended to detail the use of electronic timing in official capacity. The program can handle not just F2A but also other categories, which can be defined by the user. There are half a dozen other categories prefefined in the software package, and it is relatively simple to add a category. Almost any PC or laptop having a PC architecture can be used. There must be a parallel printer port. THE PROGRAM MUST RUN UNDER MSDOS, the old operating system. Windows interrupts the program flow now and then, and this leads to model passes being given the wrong times or missed entirely. For Windows versions later than 98 you will have to prepare a special "MS-DOS boot floppy" to run MS-DOS. However, flight data stored in a log file can be viewed under Windows. An old PC with a 486 CPU running at 33 MHz has an adequate capacity. The screen must be bright enough to be visible outdoors. All computer screens except monochrome LCD will need a shading hood! The internal batterys of old laptops are often worn out, but you want a higher capacity external battery anyway, to get at least six hours of operation. The PC program reads the sensor signal and registers the time of arrival of the transit pulse leading edge, using the standard internal timebase of the PC. The reading rate depends on the speed of the computer. A laptop with a 266 MHz Pentium gives a 42 microseconds time between readings, and a very old one, with a 8 MHz 8088 (slowest PC there ever was), gives a 3 milliseconds interval, which is too long to work. The worst-case timing error due to the limited sampling rate equals this sampling interval. The time readings are taken from a standard item in PC:s, a quartz crystal controlled timer. In normal operation this is used for timing with a resolution of around 0.055 s. Here it is reconfigured to give a resolution of 838 nanoseconds. The error of this clock is less than 1 in 10000 in all the PC:s I have checked. This error can be reduced by calibration, with a correction entered into the software. The program is able to correct for a missed lap (due to underflying) inside the laps 0 to 9. It also handles sorting out of stray pulses due to, for instance, birds, butterflies or (heaven forbid) R/C models passing. To measure the timing errors of the sensor itself, an even more accurate system must be at hand, and none is. Instead, some reasoning could be done: For F2A models flying at 80 m/s with a fuselage length of 0.4 m, it takes 4.8 ms from it enters the field of view until it is entirely visible. Somewhere in this interval the sensor output pulse is produced, meaning that the difference in time between the actual entry and signal output can hardly become bigger than this. As the speed is determined by the difference of two measurements, most timing errors will cancel. Any net timing error is due to differing conditions for the start and stop registrations, which could be due to flying height differences and lighting changes. It is a fair assumption that the timing error is well below 1 ms.
At the 2004 World Championships, where two independent systems were used, the time difference was typically less than four units in the fourth decimal, that is 400 microseconds. Most of the mentioned errors do not accumulate lap by lap, but have the same value for the total of 9 laps as for one lap. The exception is the PC crystal controlled timer error, and this contributes an error well below 1 ms in 12 seconds, especially if calibrated. Knowing that the separations of the stopwatch times of good manual timekeepers can be 0.03 seconds, and that sometimes they are much more, we can project this system to be 20 - 100 times more accurate! The indicated timekeeper uncertainty of 0.03 s corresponds to 0.75 km/h at 300 km/h. As the separation of places at championship events is typically less than that, it is obvious that manual timekeeping is inadequate. The design, prototype construction and testing were all done in the period April - June 2000. First test was on May 1st, with sensor alone, no PC connected, just a light emitting diode to indicate the output signal. It worked right away for F2C models. First test on F2A models with a PC connected was two weeks later, and the second in the Limfjords World Cup competition in Aalborg, Denmark, June 9-10. Then it was tested at the World Championships in Landres, where lots of flight data was recorded. A printed circuit board was designed already then, and drawings for a box. I gave this to a few sheet metal companies, and got a decent offer from one leading to an order. Then nothing happened, the company was too busy with bigger jobs! Only after actually ordering from two more sources, after ~6 more requests, I finally got the boxes made, in the spring of 2004! The problem of timing C/L models optically has been on my mind for a decade, at least. Some work on this idea was done in 1997, with the study of stopwatch data from the F2A event at the 1996 W/Ch in Sweden. This led to a Swedish rule proposal redefining the handling of stopwatch readings as well as a provision for the kind of electronic system described here. This rule was approved at the 1998 CIAM plenary meeting. From 2005 the rules have been further amended to clarify the use of electronic timing in official capacity. I'm indebted to Pete Soule for providing the design idea to get rid of the lens and the array of phototransistors I had in mind, and use just a single phototransistor and a slit.